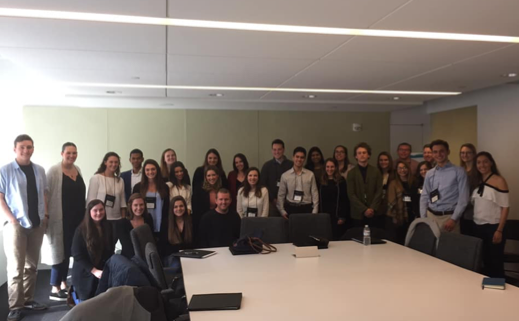 This past Friday on April 5th, 2019, a group of over twenty Bentley students visited the MullenLowe office in Boston, MA. Paul Stanish, Bentley Career Coach, set up this event with Kelly Lane, HR Rep at MullenLowe. A panel of seven Bentley alum spoke about their stories and gave advice to the group of students. There was also a Q&A session, along with a brief networking session. Here are some key takeaways the students learned! You will not always be working with a “big name” client, but it is still very valuable to work with any client and gain that experience. Agencies are very competitive, so find a way to make yourself stand out. Be prepared to work in a fast-paced, constantly changing environment. Everyone takes a different career path. You’re going to grind in the beginning, but you will eventually move up! Take a leap of faith on LinkedIn. The jobs at MullenLowe are full of variety, excitement, and fun! Being versatile as a candidate because you will be changing clients. We hire people that scare us because Mediocrity scares us more. Know how outside classroom experience matches with interest in the classroom. Good luck to all those going after their career dreams! Don’t lose focus of what you want.